YOU MAY HAVE noticed that we are no longer posting fresh content on DailyEdge.ie. After nearly nine years of laughs, tears, makeup and crisps, we have decided the time is right to wind down the publication. 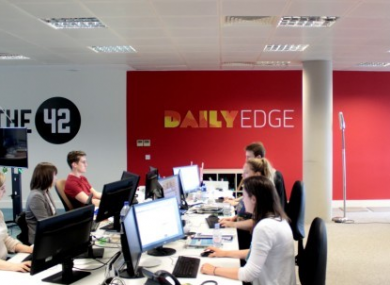 DailyEdge began life in 2010 as a much-needed irreverent take on internet pop culture, with a deliciously Irish slant. Who knew that the Rose of Tralee badly needed a detailed liveblog following every hip hop-bopping, proposal-fielding contestant until we launched one? Can you even imagine watching the Toy Show now without someone to confirm that, yes, Ryan Tubridy did just tell everyone that “there’s a dancing Mickey for everyone in the audience”. That was us. Much of the subject matter you enjoyed on DailyEdge.ie may have been light-hearted – but our commitment to it was deadly serious. When Irish TV audiences were agog at the case of the hurling statue and the hottest crime doc on Netflix in 2016, we went the extra transatlantic mile to solve the mystery (and the rest). When Ireland got the version of The Sopranos it deserved in Love/Hate, we knew it was time to apply the TV recap format that had been missing from telly criticism here. Recently you’ve loved Louise McSharry’s straight-talking beauty insights, Fiona Hyde’s unique brand of relationship advice, and coverage of everything from Gaeilgeoirí on Instagram to navigating loss on Mother’s Day. Plus there was the time we reunited a Dublin woman with her talking cat, and helped more than 369,000 of you through the tricky experience of turning 30 in Ireland. Truly, this was public service at its finest. But most of all, we enjoyed exploring with you what it means to be Irish, to feel Irish and to eat like an Irish person. If dividing the country with the final, definitive and as yet unbettered ranking of chocolate bars is a crime, consider us guilty. We think you can take it from here. For our part, we’ve loved the journey and our publishers Journal Media have some exciting plans for the future. You can still keep up with Ireland’s most popular online news source TheJournal.ie, get to the heart of sport on The42, and find the sharpest business insights on Fora. And watch out for Noteworthy, an investigative journalism project launching very soon. Email “Bye from DailyEdge.ie, and thanks for all the memories”. Feedback on “Bye from DailyEdge.ie, and thanks for all the memories”.